Our Code of Ethics is something we are very proud of, and strict about, taking time regularly to ensure all our members adhere to its elements. 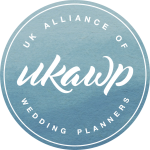 As our membership base grows, this becomes increasingly time consuming, but nonetheless important, as we know from discussions with brides and suppliers that this is one of the main reasons they like working with UKAWP members. Although as Directors of the UKAWP we tend to think the reasons for each line of our Code are self explanatory, we thought it was worth reviewing for our readers. One would think any business should do this, or leave a message explaining when staff will return should they be away, but we are constantly surprised, when telephoning wedding service providers, how many businesses don’t have a business answer phone message or even a message at all. Clients and suppliers alike need to know whether you are still in business and when they will be able to speak to you. Managing someone’s wedding usually involves being party to a lot of personal information and client stress. Our clients need to feel secure that their data, their tears and their opinions remain confidential to the person they have entrusted with their wedding and are not discussed with suppliers, unless specifically necessary to a particular service provider, such as an eating disorder being explained to the caterer. We know many wedding planners have a stake in another part of the wedding industry. Indeed we have members who own bridal shops, chauffeur companies, event hire businesses etc. All we ask is that members make it clear to clients that their other wedding related business is one of many options available to them and that they will always recommend those most appropriate to the client. There are many business models within the wedding planning industry, including many companies which take commission from the suppliers and venues they recommend. The UKAWP is not by any means belittling businesses which work in this way, however it is not a practice we tolerate amongst our members. If a planner is being paid commission by venue A, generally a percentage of the client’s overall spend with that venue, and not by venue B, where is the planner more likely to recommend to the client, particularly if said planner is experiencing a low period of business or high costs? We want to be sure that our members suggest the best possible venues and suppliers for each client, without being tempted by commission payments. This is becoming increasingly important as the industry grows and as the British public seems ever more comfortable with the idea of suing a business for the slightest accident. If a planner, rather than any other wedding supplier involved, is held responsible for someone tripping over a wire/ briefcase/ chair and rendering themselves unable to work, the planner might find themselves responsible not only for medical fees, but also for loss of earnings. Public Liability Insurance is therefore essential to guard against such expenses. Clearly some of the suppliers working on a wedding will need the direct contact details of the client, however it is important that anyone a planner gives these details to uses them only for the wedding and not for marketing purposes. Such details should also be destroyed soon after the wedding. Plagiarism is rife within the industry, which seems very strange when you think that someone who considers themselves sufficiently creative to design other peoples’ weddings, ought, and should wish, to be able to write their own website copy. At the UKAWP we see countless examples of text/ images lifted directly from one planner’s website and used on another. A bit of a ‘catch all’ perhaps, but there are times when it is important to remember this part of the Code. An example would be if a planner were undertaking partial planning for one client and full planning for another: albeit you will of course spend more time on/ have more meetings with the latter, it is important that the former client is given the appropriate amount of a planner’s time and effort, even at busy times. We hope this whistle stop tour of our Code of Ethics has answered any questions and made things clear. I think that these are so important – especially whilst there is no regulation – which when you consider the amount of money that we can be responsible for is ridiculous really! Mostof them are good manner and business practise but unfortunately, all industries have people working in them whose integrity isn’t quite what we’d like it to be. I am very surprised that some planners still ask for commission payments from venues and suppliers, this is the most unethical way to work and I feel can lead to dishonesty.